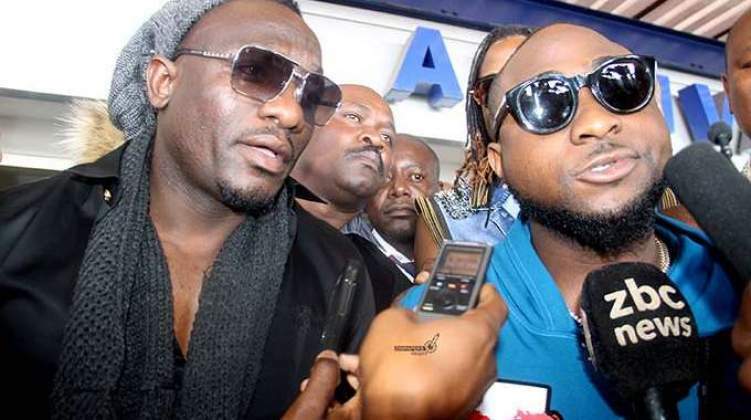 Nigerian superstar, Davido, who is expected to perform at Harare International Conference Centre this weekend landed Thursday afternoon at Robert Mugabe International airport. He was welcomed by socialite Genius 'Ginimbi' Kadungure and local star, Jah Prayzah. On arrival, Davido was taken away in sleek cars owned by Ginimbi and driven around the city as part of marketing the show abd convincing locals that the musician has landed. The musician who is booked at five star Miekles Hotel found a sizable crowd waiting for him. The platinum package is going for $2 000 where the guests get alcohol worth $2 000 and five free tickets and a personal waiter. The gold package is $1 500 and comes with $1 500 worth of alcohol and three free tickets and a personal waiter as well while the silver package, going for $1 000, has $1 000 worth of alcohol and two free tickets and personal waiter. Ordinary tickets go on sale today, merrymakers will have to fork out $20 (ordinary) $50 (VIP) and $100 (VVIP). Tickets are available at Chicken Slice branches, Coloursel Furniture as well as Liquor Boys Bar and Butchery in Mt Pleasant. South African actress and television personality Boity Thulo, who will host the concert, is expected in the country on Friday. Davido is set to share the stage with Jah Prayzah, ExQ and Killer T, while Judgment Yard will be among the wheel spinners.